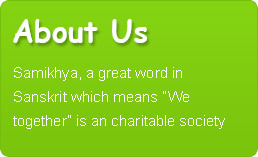 Samikhya, a great word in Sanskrit which means "We together" is a service organization formed on August 16th 2008 with a Moto of "Education For All", realizing that education is the main weapon in building better society and better India. It’s been six successful years ever since our first "Walk Towards Wisdom" was started. Samikhya Charaties is well empowered by the services of its members who are well off and employed at nuke and corners of our country and also abroad. We mainly believe in the Team work which is our “Driving Force” towards achieving the goals of the organization. During its short journey till date, Samikhya Charities mainly focuses in providing educational assistance to underprivilaged children irrespective of caste, creed and culture. Well equipped with the collective resources in terms of technical, financial and manpower, Samikhya Charaties is all set to bring about changes in the conditions of the poor people. Till date it has added feathers to its service activities by sponsoring more than 50 childrens education also by conducting various social responsible events. To be clear Samikhya is a Non-Political and Non-Religious Organization and will definitely become a platform for thousands and thousands of people who have the vision of helping the poor and needy. It is undoubtedly a multidisciplinary, student participation driven transparent charitable society. Reg.No. 693/2008, Kakinada Mandal, E.G.District, AP. As a Charitable society , Samikhya promotes and catalyses education among underprivileged children, create the process to embrace these children into mainstream in sustained manner. Please enter your email address to subscribe and to get our latest news. Copyright © 2008 - 2019. Samikhya Charitable Society All Rights Reserved.